This is the second part of our New Years Eve Trip Report! If you missed the first part I suggest you check it out! All the photos for this particular report can be found on flickr. Once all the shows wrapped-up they wasted no time to get into New Years mode. A live DJ began spinning in front of Cinderella’s Castle with the best (family friendly of course) dance music. Standing in one spot for over three hours does make one very hungry. It was extremely crowded everywhere we went and we managed to make our way over to Fantasyland through Tomorrowland. 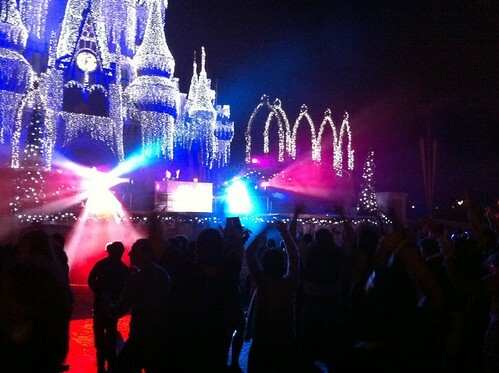 The music was pumping through the entire Magic Kingdom. 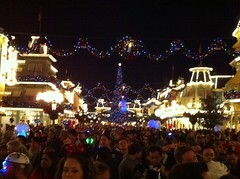 The entire park was transformed into one massive family friendly dance club for the rest of the evening. While making our way to Pinocchio’s Haus to grab something to eat there were various Cast Members dancing in the streets! 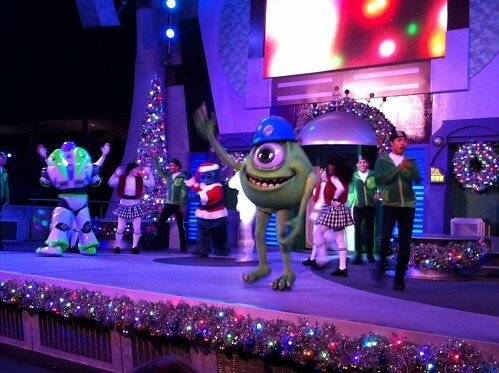 You could feel the energy of all the guests and Cast Members throughout the entire park. 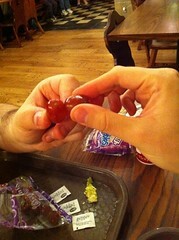 Closest we had to wine. While consuming the closest thing we could get to alcohol in the Magic Kingdom (grapes) I could hear the sounds of Eurobeat playing outside! Lets say that it made me very happy to hear this! Wait times for all the major attractions were well above an hour, so we decided that we were just going to go around taking photos and just soaking in the entire experience. Walked around the side of the castle and snapped a few good photos. To get out to the crowds we headed on over to Tomorrowland and went on the Carousel of Progress. A few of the guests in there had the same idea as us, but they decided to sleep as well. 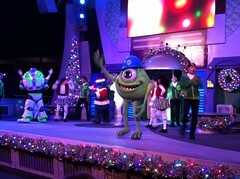 We got to catch the Totally Tomorrowland Christmas show. 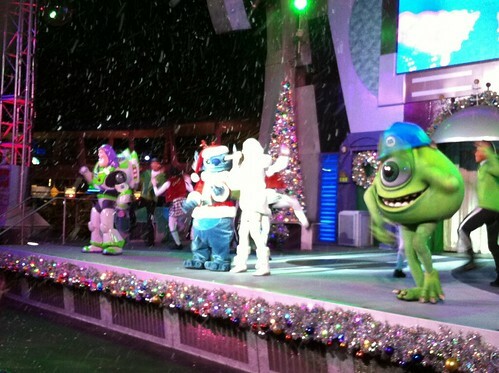 Where Buzz Lightyear, Mike, and Stitch put on a show just outside of Space Mountain. Got a few photos of the performance. It was around 10:00 pm at this time and we thought it would be a good idea to try to find a spot for the fireworks and countdown. While we tried to make our way back to Main Street, they turned the bridge into Tomorrowland into a one-way traffic bridge. 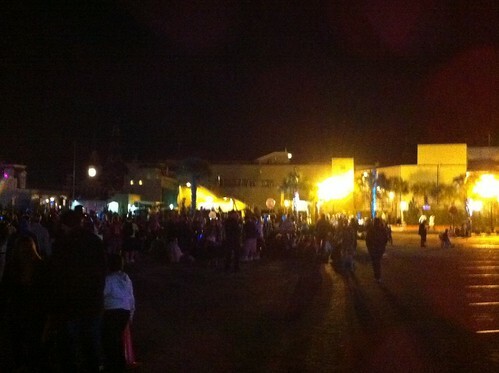 We were re-routed through the backstage area (near Buzz Lightyears Astro Blasters) to Main Street. At first, I thought maybe this was always a path that I didn’t know about, but I clued in pretty quickly that they opened this to relieve the massive amounts of traffic. It was all decorated and there were people sitting in areas to watch the show. 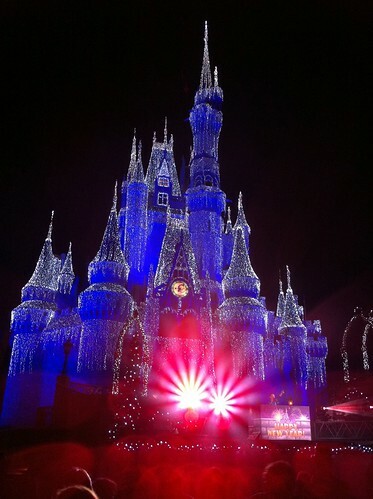 You could clearly see the castle from the backstage area. While making our way from backstage to the beginning of Main Street it was completely wall to wall people. We saw some Paramedics literally pulling someone out of the crowd. Not entirely sure what happened but the person was pulled out of the crowd and put on a stretcher inside one of the Main Street shops. We cut through the shops to get further down Main Street, there was no way we’d make it through the wall of people outside. 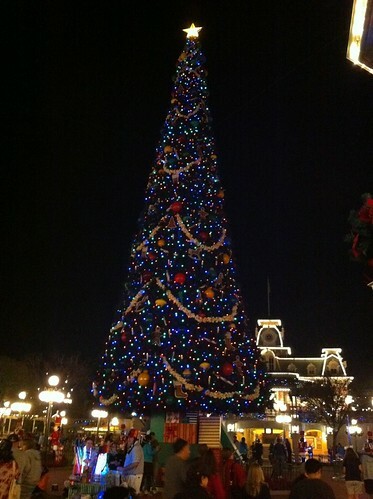 Finally popped outside and blended into the crowd near the end of Main Street (it was the closest we were going to get). 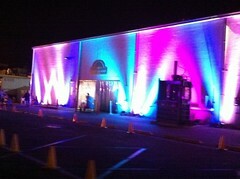 This was our spot for the remainder of 2011! A few times I noticed Cast Members going through the crowds appearing as they were looking for something. Found out later that they were actually going through to ensure no one has alcohol on them. I do recall begin able to smell beer from time to time. At 11:50 pm it was time for Fantasy in the Sky! 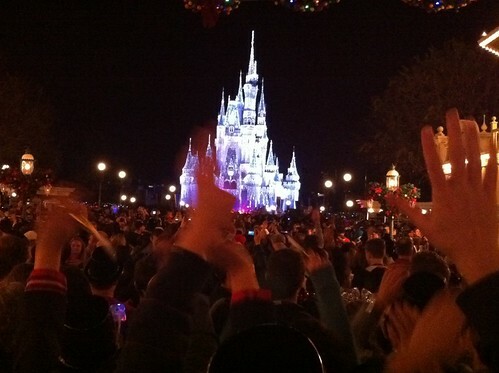 This is their special new years’ fireworks (they showed them the night before as well) that goes right until Midnight! The fireworks were phenomenal. Most of the fireworks were mirrored at the entrance of the Magic Kingdom so everyone was able to see them. 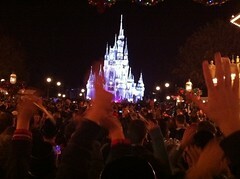 Once the fireworks were finished it was time for the Countdown with Mickey & his friends! Now that it was officially 2012 we wanted to ride our first attraction of the New Year! Thankfully we grabbed Fast Passes for Space Mountain about 6-7 hours before that were good for after midnight. As you can imagine it was a complete traffic jam as Cast Members tried to herd everyone. There were people bring to leave the park and those going further into it. 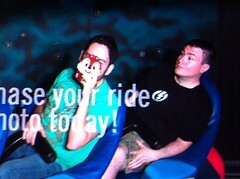 While we were making our way to Space Mountain we witnessed two full-grown men getting into a fist fight. The clearly didn’t know each other and their respective families were trying to hold them back. One of the guys started running down Main Street (people seemed to clear where they were so there was room for him to run). Completely unnecessary and dangerous. There were tons of families around holding infants and small children. Completely idiotic. Finally, after about 30 mins, we made it to Space Mountain. 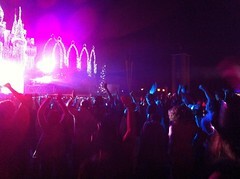 The music was still pumping throughout the Magic Kingdom and Lady Gaga came on. The crowds started to thin out a bit but you could still feel the high energy from all the guests and Cast Members. People were dancing everywhere you looked! We made our way through Fantasyland and cheered on a few Cast Members that were dancing in the middle of the street or at their snack stand! It was a lot of fun seeing everyone having so much fun. 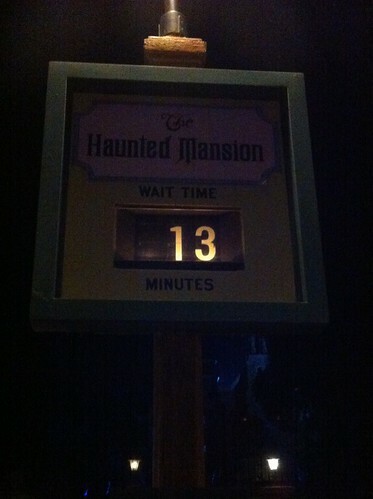 The wait time for The Haunted Mansion was only 13 minutes (HA) then ended our evening on Big Thunder Mountain. Walking through Adventureland you could still see a ton of people at the foot of the Castle dancing. It was now close to 2 AM and we were both completely done. Being in the park for over 19 hours was quite the adventure. The wait for our bus to get back to our resort was a couple hundred people deep. Didn’t end up getting back to the Resort until closer to 3 AM. What a day, it was like taking three normal days and cramming them into one. While it was extremely crowded (found out the park reached capacity at 10:30 AM), it was a fantastic experience and got to see pretty every show you could imagine at the Magic Kingdom. I would do it again in a heartbeat. The atmosphere and energy of the park was something to experience. This isn’t for those that dislike large crowds, at all. Happy New Year and Good Night I’m extremely exhausted! What a long and exhausting day but also one of the best days I’ve had at a Disney Resort thus far! Don’t worry there’s still plenty to our trip. 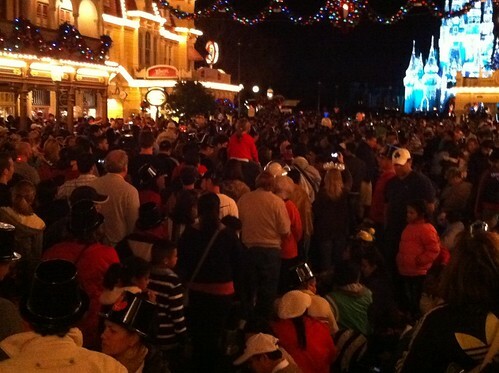 Make sure you come back for more reports of our New Years Celebration trip! If you wish to view all the photos from this day head on over to my Flickr!